Week three of Mo’vember and we’re on the downward slope now so I thought I’d better return to my Frostgrave warband and fill out my ranks a bit, and as they all have beards that scores me extra brownie points too. So I’ve pulled out the three “Foundry” Vikings I bought off of Ebay, now I know quite a few “Frostgravers” like to have a colour scheme that runs through their whole warband to tie them together as a group, but I decided I prefer the idea that these are “jobbing” ex-soldiers and adventurers that have been hired fully equipped and so come pre-armed out-of-the-box with their own weapons excetera, this also means that if I make up any more warbands I can “mix and match” my recruits between them (this will probably never happen but hey’ I like to justify these things). Anyway as these have already had shields (from a source I can’t remember) glued in place as well as being based up and black undercoated a couple of weeks ago in readiness, I was able to dive straight into their painting…. Uthred, my Man-at-arms (80 gold coins) was begun by giving everything a dry-brushing of chain-mail before I added all the straps and boots along with the back of his shield and the handle of his axe in chocolate brown that was then either highlighted in leather brown or butternut dependent on whether it was leather of wood. I then painted his trousers in royal blue highlighted in the same with coffee added to lighten it, but this looked awful so I re-did them in a mix of chocolate brown/ butternut and orange that was then highlighted in butternut and orange, much better. Shield next this was undercoated in light blue and then highlighted in porcelain blue, this then formed the background for me to get creative (ha ha) and add the dragon in black and dark grey. His sleeves were then done in butternut highlighted with a little coffee and his flesh (as with all three figures) was added in European flesh highlighted after his eyes (yes he does have eyes) were dotted in with the same mixed with pale flesh. Then his cape was painted in royal blue (well it was still out), and the highlights were done in the same with a little light blue in the mix. His hair is a mix of chocolate brown and chestnut with some dark grey highlights to add to his experienced air. Then it was just the hilt of his sword and the crest on his helmet to do and these were completed in bronze and copper as base and highlight. 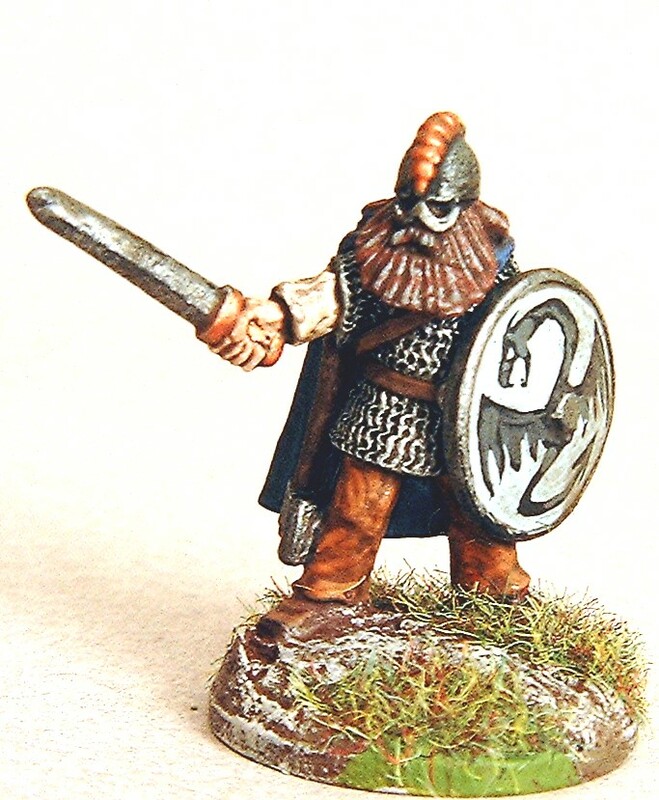 Finnan, my Infantryman (50 gold coins) was again given a dry-brushing with chainmail first before his leather and wooden items were undercoated in chocolate brown and highlighted with leather and butternut respectively. Then I went to his shield and I decided his shield design should not be as fancy as Uthred above so after laying down a base of coffee and cream added the curved red stripe and dots in dark red that I then highlighted with pink burgundy. The bottom edge of his leather jerkin was done in bright red with terracotta highlightes too continue the “red” theme (He’s only an infantry man, and we all know what happens to the chaps in red on “Star Trek”, Oh no, wait my Wizard and Apprentice are in red too, I hadn’t thought of that!! ), and this was carried through onto his cape that done in dark red with highlights of pink burgundy mixed with bright red, to vary the colour slightly from his shield. His flesh that came next was completed in the same colours as above (as stated). His hair was undercoated in dark sand (as I said last week I have too different shades of sand, but annoyingly they are both just called sand!) and this was then dry-brushed with citrus orange. Finally his sword hilts and pendant were added in bronze and copper. Then Hookton, my Archer (50 gold coins) was yet again dry-brushed with chain-mail first before (you guessed it) his leather and wooden bits were painted as above. Then as he is an archer I painted his tunic in deep bronze green mixed with a little black to darken it before highlighting it in just deep bronze green (I nearly always end up doing archers in green, must be some sort of “Robin Hood” fetish), this was continued by adding his under shirt in scenic green that was highlighted with a little lime green. The fledging on his arrows was next, coffee and cream taking care of this and while they were out I painted his shield in these too, before quartering it with shamrock and highlighting these with a shamrock/light green mix. His hoes’ were painted khaki highlighted with the same lightened with a little coffee, and his flesh as above. Due to his lowly status he has no bright-work on his swords so that meant after his hair was added in citrus orange and “pale” sand he too was complete. Basing was carried out as usual (Chocolate, khaki, coffee, scenic green etc..) and then the final matt varnish spray coat was applied and they were ready to join their compatriots and meet their fate in the chilly city once known as “Felstad”, or at least they will be once my last warband addition gets painted next week. Please be sure and check out the other Mo’vember contributors at their blogs…. Remember “Stay frosty!!”. Cheers Roger. cracking stuff Roger. You really do paint these sorts of models very well indeed and I’m especially in awe of the work on your Man-at-Arms. Just delightful brushwork and once again your choice of paints (particularly chocolate) have made me hungry 😉 I’m really looking forward to a warband group shot!! Thanks Simon, I’m afraid I’ve been playing it rather safe with my Mo’vember choices this year, nothing too outrageous (like Hitler for example). The shield design was a bit of fun, and a reference to the fact that Myles was rather disappointed that there are no dragons in the “Frostgrave” rules. You’ll have to wait till my last “band” member is finished before I do the full line up photo, hopefully next week, though I have a feeling that I might be a little late posting next week due to my own tardiness in preparation of one of the figures (and he’s the one with the beard!!). Oh well we’ll see how I shape up during the week ahead. Nice work, Roger. 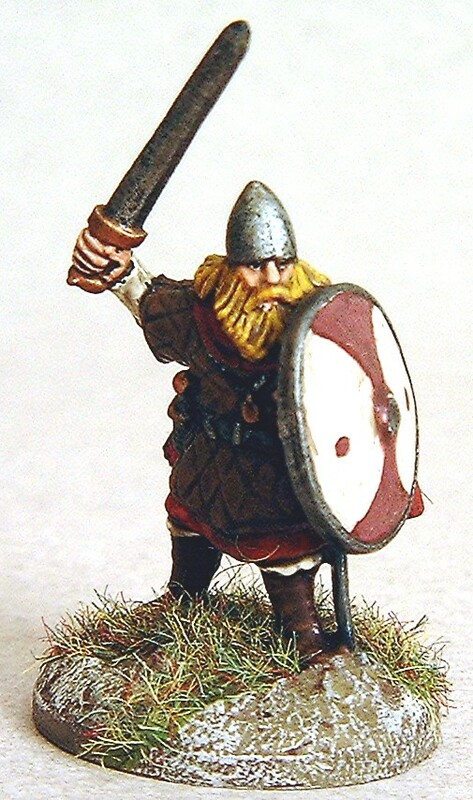 Your warband seems to have a Norse flavour to it. 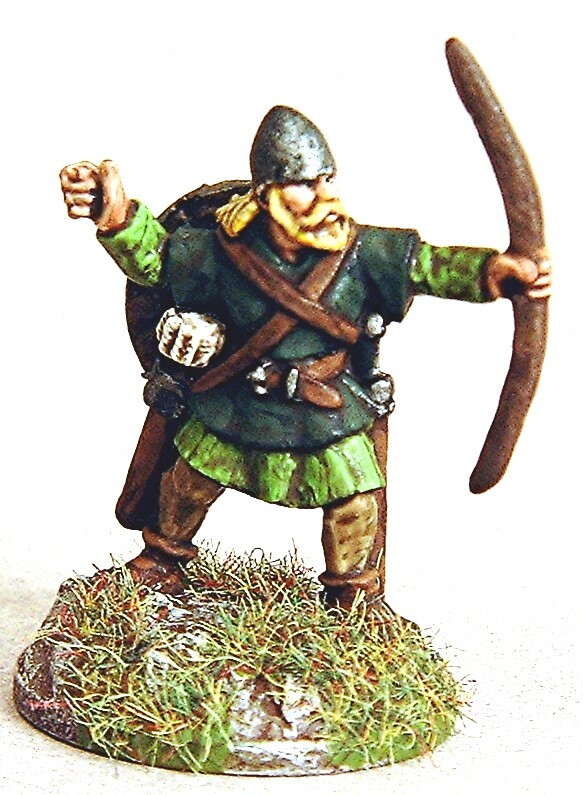 I have been considering getting some plastic picts to use as Frostgrave zombies, as I feel they would be more in keeping with the setting than normal fantasy zombies. With a suitable frostbitten colour scheme, of course. My warband is complete, including a ‘blast from the past’ barbarian and some of Kringle’s ‘toys’. Thanks Jez, yes it does seem to lean to that part of Europe, unintentionally I assure you. I’ll pop over and see your work now.